Having begun his artistic career as a wood sculptor, Gausson later studied graphics at the Atelier Eugène Froment and illustrated his friends’ poetry before moving on to painting as a medium. Gausson was a poet himself. At the Atelier, he befriended Luce and Cavallo-Peduzzzi, who would each have a significant influence on his style. 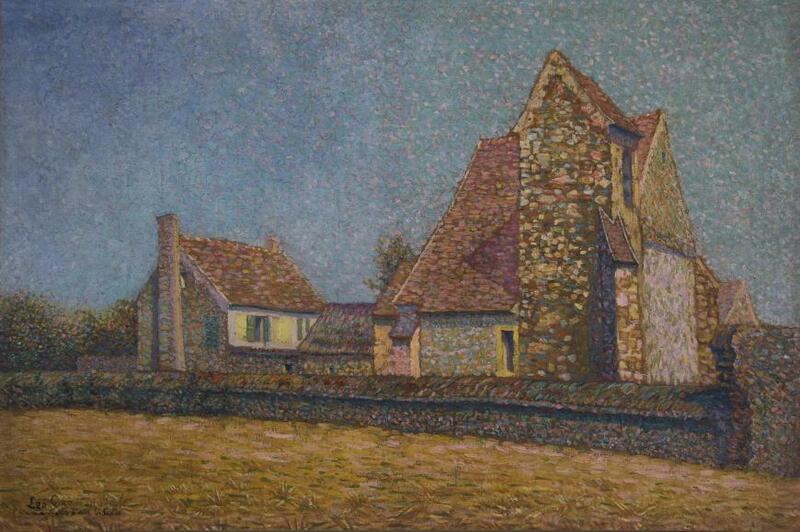 Gausson also drew from the work of Pissarro, Signac, Van Gogh, Gauguin, and Bernard in his paintings. Stylistically, he began as a Neo-Impressionist, and later moved toward Synthetism around 1890. He exhibited at the Paris Salon for the first time in 1886, and would exhibit at the Salon des Indépendants from 1887-1900. In 1892, along with Luce, Pissarro, and Toulouse-Lautrec, he exhibited at the Groupe des Vingt exhibition in Brussels. He has been included in important 20th-century Post-Impressionist exhibitions, including one at the Guggenheim in 1968, one at the Musée Maximilien Luce in 1978, and one at the Musée Camille Pissarro in 1985. Here, Gausson depicts the titular Farmhouse (Ferme) as part of a dreamlike pastoral vision awash in hues of soft orange and calm blue. Ferme is one of the artist’s most evolved Neo-Impressionist compositions, though completed at a time when he focused largely on developing his Synthetist style. Gausson has deftly handled the tones of the earth and sky, their depth revealing the artist’s supreme understanding of the effects of light and material. The viewer observes the rich differences in texture between the straw-laden ground, brick chimneys, and red slate roofs. This piece was painted in 1909, toward the end of Gausson’s time spent living in Africa (1900-1910). It is remarkably crisp in it delineation of forms, especially given the pointillist direction Gausson has taken here in his handling of paint. Please notify me when works by Léo Gausson become available.